Three Billboards Outside Ebbing, Missouri is unstoppable this awards season. 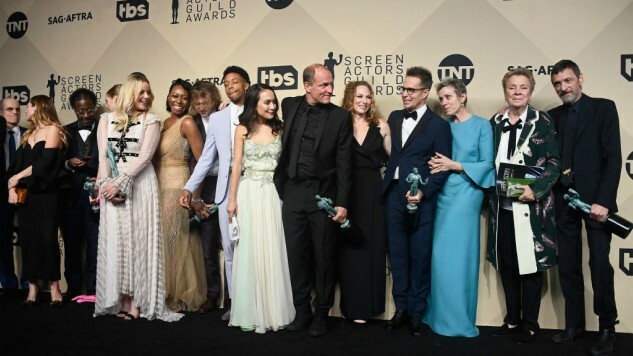 The film has already won numerous awards, including Best Motion Picture Drama at the Golden Globes, and now it’s cleaned house at the 24th annual Screen Actors Guild Awards. The film took home three awards, including Outstanding Performance by a Cast in a Motion Picture, Outstanding Performance by a Female Actor in a Leading Role for Frances McDormand and Outstanding Performance by a Male Actor in a Supporting Role for Sam Rockwell. This is Us came as a surprise winner, taking home Outstanding Performance by an Ensemble in a Drama Series and beating out the predicted winner, Hulu’s The Handmaid’s Tale. Veep won for its second consecutive year in the Outstanding Performance by an Ensemble in a Comedy Series category, while the show’s star Julia Louis-Dreyfus won Outstanding Performance by a Female Actor in a Comedy Series. It was a good night for HBO’s Big Little Lies, as well, with stars Nicole Kidman and Alexander Skarsgard both taking home awards for Outstanding Performance by a Female Actor and Male Actor in a Television Movie or Limited Series, respectively. For the very first time, Kristin Bell served as the host for the awards show and women presented all 13 acting awards in response to the #MeToo movement and Time’s Up initiative. Traditionally, a male and female actor has presented each category. Academy Award winner Morgan Freeman was honored with a Lifetime Achievement Award. Check out the full list of winners below, and read our review of Three Billboards here.